The lamrim (“graduated path”) is a textual tradition that organizes Shakyamuni Buddha’s teachings into a complete step-by-step path to enlightenment. 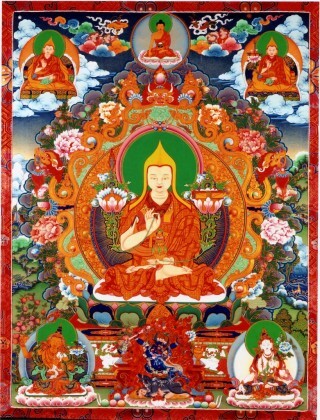 Lama Tsongkhapa (1357–1419) is the founder of the Gelugpa school of Tibetan Buddhism. Je Tsongkhapa’s Lamrim Chenmo or The Great Treatise on the Stages of the Path is one of the most renowned Tibetan Buddhist classics. Lama Yeshe Wisdom Archive‘s FPMT Lineage is a series of Lama Zopa Rinpoche’s teachings on the lamrim drawn from his four decades of discourses on the topic. It is based on his own textbook, The Wish-fulfilling Golden Sun (available in .epub and .mobi formats), and several traditional lamrim texts, and is generally arranged according to the outline of Liberation in the Palm of Your Hand by Pabongka Rinpoche. When completed, this series will be one of the world’s most extensive contemporary lamrim commentaries. The Heart of the Path: Seeing the Guru as Buddha: Drawing from nearly fifty teachings, this is a lengthy collection of Lama Zopa Rinpoche’s teachings on guru devotion. How to Practice Dharma: Teachings on the Eight Worldly Dharma: Lama Zopa Rinpoche’s indispensable commentary on the eight worldly dharmas. Perfect Human Rebirth: Freedom and Richness on the Path to Enlightenment: Lama Zopa Rinpoche explains in the greatest possible detail just how precious a perfect human rebirth is and why we should not waste a moment of it. Wish-fulfilling Golden Sun: Published in 1975, this text has been preserved in its original form and should be used with the understanding that many standard styles, pronunciations, and prayers have been revised and updated since the time of publication. FPMT Basic Program: This text based, in-depth education program includes the subject Stages of the Path, presented by means of an oral commentary on Je Tsongkhapa’s Middle Length Lamrim. Discovering Buddhism: This is a two-year, fourteen-module series that provides a solid foundation in the lamrim. Living in the Path: This lamrim program is based on Lama Zopa Rinpoche’s teachings on Atisha’s Lamp for the Path to Enlightenment. FPMT Education Services has created a schedule to help you plan daily lamrim meditation sessions over the course of a calendar year. It was created on the basis of the book The Essential Nectar by Geshe Rabten, which is available through the Foundation Store. The schedule is available as an Excel spreadsheet or PDF.